Back in 2003-2004, I borrowed $31,064.02 to attend graduate school. This was okay at the time, as I was following the conventional wisdom to not borrow for education more than your first year’s salary. The amount listed above was just under what my starting salary as a first-year teacher would have been. Instead, I got a job as a secretary, which paid much less than that first-year teacher salary. My Secretary I job brought in a paltry $9.10 an hour. There is a lot to be said about why I made this decision, but that is not the focus of this essay. The consequence of my decision was that I signed up for the 20-year graduated repayment plan instead of the 10-year one. This means my expected payoff was scheduled for June 14, 2024. In hindsight, when I switched jobs after a year an a half and got an $8000/year raise, I should have switched payment plans to the 10-year plan. But I did not. For many years, I trundled along paying just my monthly payment. Only since I’ve begun my new job have I been making extra payments. As mentioned before, I’ve been reading a lot of Mr. Money Mustache. Yesterday, I encountered his post News Flash: Your Debt is an Emergency. This was the second time I’ve read this post, as it is also part of Start Here: Getting Rich from Zero to Hero in one Post. When I read the debt emergency post the first time, I nodded. Yesterday, when I re-read it, plus the linked post about the guy who paid off $90,000 of student debt in 10 months, something clicked and I’ve been reborn. I’m putting all hands on deck to get rid of this debt. My current balance as of today stands at $13,441.22. My current budget allows for my regular scheduled payment of $189.37, plus an extra payment of $180.00. My goal is to scrape off wherever I can to add to that extra payment. I’m not going to go to the extreme measures the $90,000/10 months guy did. But I’m going to massively economize. Where the money for my extra payments came from. 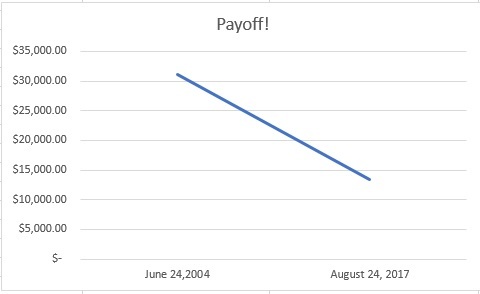 To get us started, here’s a quick Excel graph of my progress over 13 years. *Here’s something I’ve already learned in the 25 minutes I’ve been doing this project: my extra payments aren’t going to the principal only. I will make it a priority to find out if I can change that. **This is something the $90k/10mo guy did, and I like the idea. ***Right now one major road block I have is the number of friendships centered around socializing while purchasing food/drink. More on that later. I am excited to see how this goes. I still have some loans left from my first semester of grad school and have started to add new ones with my PhD. Thankfully I have graduate assistantships to offset and minimize those loans. Yeah, there were a couple of graduate assistantships in my program. I wish I had known to apply for them. The message, “this program is intense, you are better off not working,” was delivered repeatedly. I listened. I wish I wouldn’t have. Plus, I didn’t really understand them until it was too late. Best of luck! I’m pretty close to paying off my own grad student debt (as you know, I’m not using my degree either), which was half the amount of yours and yet here I am, nearly 12 years later, still paying for it. We’ve discussed just doing one last big payment on it, but have to pay off the first half of our solar loan first. Which, unfortunately, the solar loan was necessary because electricity is so expensive in SoCal that a monthly loan payment is cheaper than monthly electricity bills. Sigh. Adulting is difficult. I’m glad you are getting close to having them paid off, too! Also, an amusing bummer about the solar loan being cheaper than the monthly electric bill.